Your e-mail address is only used if you ever need to reset your password. The budget amount is the *total* amount you can afford to pay towards your debts (all of your minimum payments plus whatever extra you can afford). It needs to be *more* than the total of all of your minimum payments for the debt snowball to work. You can always change it later anytime you want. Here's some quick help if you need it. Let's say you have three credit cards you need to pay off. The minimum payment due on each one is $100, so the minimum amount you need to pay each month is $300. You have an extra $500 each month that you can afford to use to pay down your debt. This would be in addition to the minimum amounts due. In this example, your total monthly budget would be $800. If you're not sure exactly what your total minimum payments due, or you want to get going right now; just put in any amount (like $1,000) as your total monthly budget. You can change it any time you like. 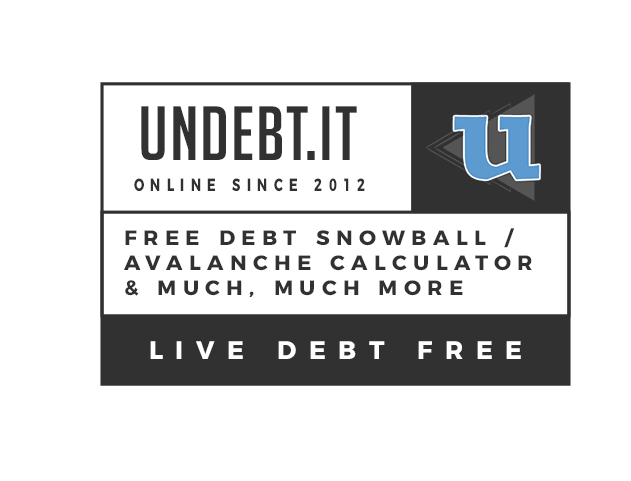 Try out Undebt.it before you sign up by taking it for a test drive with the demo account. It's pre-populated with a few accounts so you can dive right in and see how it works. The reviews & testimonial page shows what others are saying about the site. How much can you afford each month to pay down debt? For example, let's say you have debt accounts with total minimum payments of $600; you can also afford to pay $400 on top of that each month. Your total monthly budget would be $1,000. The social media account information in ONLY used to verify your e-mail address and get your profile name. No other piece of information is kept or used in any fashion. Undebt.it will NOT access your timeline, history, posts, friend list in any way. Nothing will ever get posted to your account. If you have registered with Undebt.it using a social media account and would like to disconnect the two, just go to your Undebt.it My Account page and change your password. While your there, make sure the e-mail address is correct. Now you'll be able to login with that e-mail/password combination.